Victoria Cohen is an artist, photographer and author whose practice involves capturing in images the interplay between environments, her own observations and the human form. A born and raised New Yorker, Cohen produces photographs whose visual language conveys a rich narrative that explores culture, sexuality, and personal associations. In her well appointed studio in midtown, Victoria showed me just a portion of what represents her vast compilation of photographs – most of which involve almost no retouching or manipulation. Her work shows versatility and amplitude in her artistic vocabulary. Many of Victoria’s photographs document New York in an impromptu, unadulterated and unedited way. She shoots mostly in large format of 4 x 5 and a lot of her images have a nostalgic feel of the New York that is gone and has shifted toward gentrification and mass-produced consumption. One of Victoria’s most interesting bodies of work is that which she produced in the summer of 2011: the photographic documentation of New York’s Hotel Chelsea before the landmark building changed owners and went under a massive renovation which is still underway. The Hotel Chelsea was for many years the home of some of the most creative artists, writers and musicians of the 20th Century including Bob Dylan, Janis Joplin, Allen Gisnburg and Sid Vicious. 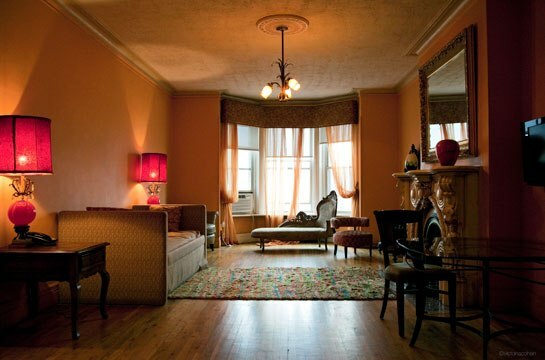 Victoria was the only and last person who was able to capture the full essence of the bedrooms, hallways and lobby of this West 23rd street building which was such an important art-scene hub and remains to be a historical gem in the center of Manhattan. Brilliantly laid out in a beautiful hard-cover book, Cohen was able to gather the best images for her book “Hotel Chelsea” which was published last year by Pointed Leaf Press. The photographs are also available in large format for those who want to have a piece of New York’s history in their collections.